November 11, 2011. 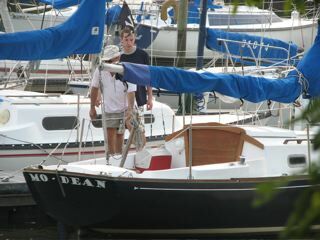 We were advised on November 23, 2010 that Mo-Dean has been sold. Her new owner is Lowell Baier. She is under going a professional restoration, and her new name will be Equinox. We have been standing by for Equinox to check in. We were following up on this and, in the process, found copies of two interesting late 1970's letters that Bob and Frank sent in. They were from Sparkman and Stephens to prior #237 owners, Robert Gould of Springfield, Virginia, and Jerrell Keathley of Alexandria, Virginia. These were pretty poor copies and were 'filed'. The excuse - it was still early days of the website. But they should be part of the historical record so here they are. In November, 1966, S&S negotiations with O'Day produced an as is/where is value for the Dolphin molds and tooling at $7000 and S&S had efforts underway to find an east coast builder to use the tooling but there is no record of what actually happened to this tooling. In a phone conversation John Shumaker told me he visited O'Day in Fall River, MA to evaluate whether or not to purchase the O'Day molds and tooling but decided to build his own fiberglass molds and tooling. John recalls that "the O'Day molds were green..." He used one of the O'Day hulls as a plug to make a hull mold, and built his own deck mold. On August 24, 2007 Bob sent in the following email and pictures of Mo-Dean. Here are some pictures of our Yankee Dolphin, hull no. 237, "Mo-Dean", built in 1971. Brother Frank and I bought this boat in 2006. At that time we had just gotten into sailing and had learned to sail on Flying Scots, and we wanted to move up to a keelboat. 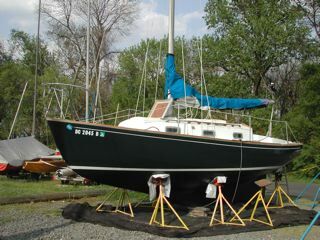 Frankly we got this boat because it came with a wet slip at the Washington Sailing Marina in Alexandria, VA where we live, and slips were hard to come by! At the time we had never heard of the Dolphin. Since then we have learned the distinguished history of the boat, mostly through your great website! Thanks! You are doing a great job! Anyway, this boat had gone through a couple of short time owners and had been sitting for a couple of years. We replaced the teak facing around the companionway; replaced the centerboard lines (the bottom one with wire; sanded the toe rail; polished and waxed the blue paint job; replaced the battery and electric panel. We cleaned the inside (a lot of wasp nests from the long neglect). The former name for the boat was "Moonraker", and was owned by a number of people. We have some old letters from Sparkman & Stephens to former owners responding to questions about the boat. I hope to scan and send some of them if you want. There are 3 dolphins based here in Alexandria at the WSM, ours, Marcia Green's Timesweep (no. 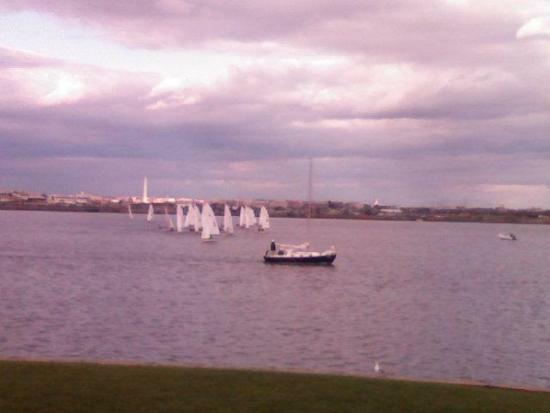 214), and the Sailing Club of Washington's Psycho (no. 222 - Webmaster Note 244 is correct # ). We race in the non spin division of the Daingerfield Island Sailing Club. One of our field investigators captured this photo believed to be Mo-Dean observing the Collegiate Women's Atlantic Coast Championships regatta hosted by Georgetown University on the Potomac River. Yes, indeed that is MoDean, Frank and I aboard, motoring out for an afternoon sail. Very enjoyable, the wind was forecast 15-20 knots gusting to 30, which it was earlier in the day. 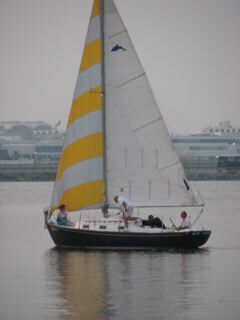 We started with double reef mainsail and working jib, and later shook out 1 reef when the breeze moderated. Also it was enjoyable to observe the collegiate competition. I understand that Georgetown won!. Go, Hoyas! Hoya Saxa!. Keep up the good work, Ron! January 25, 2009 - MoDean sails out the Daingerfield Island Sailing Club (DISC) located at the Washington Sailing Marina.